A full-size SUV should be able to tow large items with ease while offering a smooth driving experience, all things that the Ford Expedition offers, which is why it’s considered one of the more popular full-size SUVs around. In particular, the two capability features make this car stand out. There’s 104.6 cubic-feet in the back of the first row of seats, 63.6 cubic-feet at the rear of the second seating row and 20.9 cubic-feet located behind the third seating row. If you choose the Expedition MAX model, there’s an additional 16.9 cubic-feet, bringing the total up to 121.5 cubic feet, so you can easily store luggage, camping gear and other useful items. Hill start assist-and-descent control controls the vehicle’s horsepower, so you remain in control while traveling up or downhill while towing items. 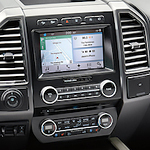 Step in to our Ford showroom and chat with a knowledgeable associate to learn more about this SUV. For the ultimate experience, get behind the wheel and take the car for a test drive.